"'Willkommenskultur', the culture of welcoming other human beings in need, feels increasingly like a distant memory." ”There's a smuggler who's been dumping people at the base of cliffs near Palios, near the eastern end of our typical operational range. Too far to walk to the nearest road or too step to climb out from safely, these spots are not readily accessible from anywhere but the water. The government vessels prefer not to operate inshore, even if they do carry small RIBs, and so it's Mo Chara that gets requested to help. Nose up to the shore, drop a land crew, assess the new arrivals, and then evacuate everyone safely, all without endangering crew members or risking harm to Mo Chara. It's a fairly technical process that requires close teamwork, but the crew of Mo Chara does it exceptionally well. The day starts simply enough. We return from a patrol that started at 6 AM--witnessing another gorgeous sunrise over the Aegean--and are spending a bit of time relaxing at the house after coffee and breakfast at Goji's when the call comes in that a smuggler has dumped a boatload full of people somewhere between Lagada Beach and Palios. We grab our gear, prepare Mo Chara for departure, and then head over to Palios as quickly as we can. It's a warm, slightly hazy day, the sea rippled by a light breeze, fishermen working their nets off Korakas lighthouse as I cut an arc around them at speed. On scene, we find a Hellenic Coast Guard vessel near a beach that is not far from our last rock rescue. After pulling up alongside for a quick chat, our first task is to find the new arrivals. Looking towards the shore, not a soul is visible. But it turns out that this group is willing to work with us: as I take Mo Chara in for a closer look, we see a person emerging from the trees and waving to us. One by one, others come out and start heading back down towards the water in single file. As far as building some trust and making initial contact are concerned, this group is clearly willing to come our way. This group is also from Afghanistan, and our lifeguard’s knowledge of some Farsi phrases helps put them at ease. There are 21 of them, 10 are children, and one minor is unaccompanied, having made the long journey on his own. We flag him as a possible vulnerable case. There's a single mother traveling with her child. An elderly man recently suffered a heart attack and carries an X-ray and the printout of an electrocardiogram with him. He's wheezing, in his late sixties, uses a crutch, and is clearly exhausted. He's part of a family and his son sits next to him on the Mo Chara as he hangs on a handrail. 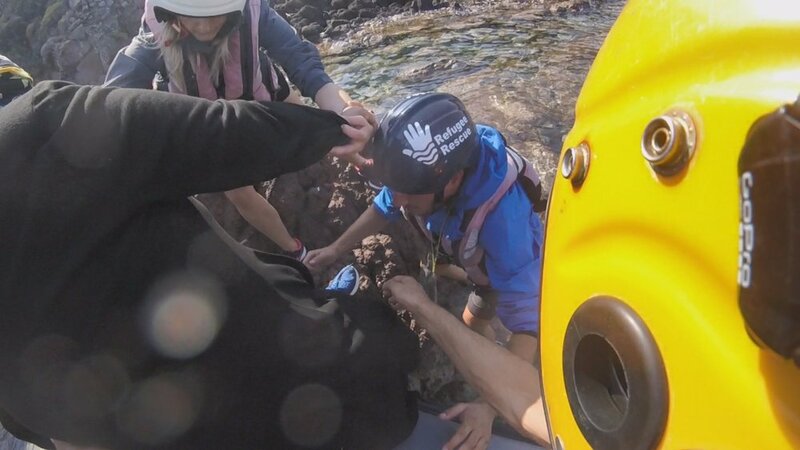 There's also a woman only a few years younger than him who is clearly in pain as she has to clamber over the rocks and into Mo Chara, getting as much help from us as we can offer. On board, she shows us a long, angry-looking welt of a scar maybe a few months old that runs lengthwise across one of her knees before she hangs her head and takes some deep breaths, her pain and exhaustion apparent. She, too, must use a crutch to get around. One of the younger boys, aged maybe ten, knows some English and translates for us, first on the Mo Chara and then again while talking to the nurse after we hand over the refugees to the land crew. The boy is part of a group of similarly aged boys who seem to be taking the day in stride, unlike some of the adults around them. Was it necessary to put these human beings through the hardship they experienced today? Hardly. The man recovering from a heart attack, the woman struggling with her knee, the unaccompanied minor ... Europe is complicit in this human suffering. Last year, when I described some of the scenes that I witnessed, I felt a mixture of quiet rage and incredulity. I cried while writing some of my posts in 2017. This year? My response is much more muted. Not resigned, but the shock value of this treatment of fellow human beings has worn off. My reaction is more entrenched. Stubborn. I know where my values lie and I am here to help and do my bit, no matter how small. But the absurdity of the bigger picture that has somehow shaded into the new normal ... the sheer scale of the problem can make you numb.